MOTOR SISTER premiere new video on Artist Direct. “Ride” available March 6th via Metal Blade Records! Today the band presents the first video from “Ride”. The video shows the band recording the song “Fork in the Road”. Check out the exclusive premiere, courtesy of Artist Direct HERE. 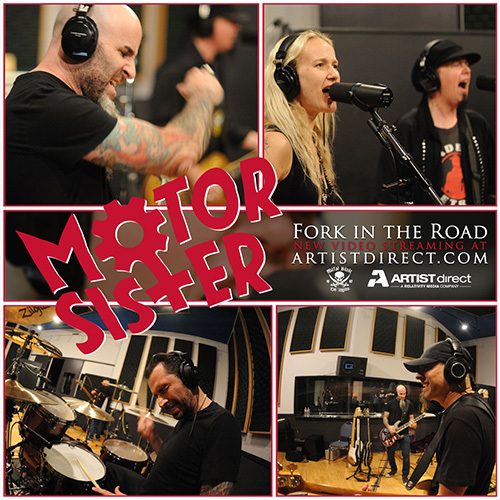 “Fork in the Road” features a rare glimpse into the recording of this Mother Superior favorite by MOTOR SISTER. The recordings from those two days are what became to be known as MOTOR SISTER’s “Ride”. The first single from those sessions, “This Song Reminds Me of You,” is available for to stream, along with a featurette video on the formation of the band and the process behind the record, at metalblade.com/motorsister.